In the Spring of 2000 I was approached by Jim Lambie, the Buyer for Oswego Productions, a movie production company based in Toronto. The firm was contracted by Los Angeles based Citadel Entertainment to produce a TV mini-series titled "HAVEN", starring Natasha Richardson with American co-stars Anne Bancroft, Hal Holbrook and Martin Landau. CBS Television will air this $30 million production in February 2001 during the TV "sweeps". HAVEN tells the true story of a brilliant young Jewish government official who finagled President Roosevelt to provide an aging army troop ship to transport 1,000 Holocaust survivors across the Atlantic to an interment camp in Oswego, New York. In spite of the reference to a Liberty in the book that documents this event, a Liberty ship played no part in the real story. It was the HENRY GIBBINS an Army troop ship. (This is according to Ernest F. Imhoff of the Baltimore Sun). Jim was tasked with the job of procuring equipment typical of the period and of equivalent functionality. Seeing that a merchantman's radio room was too small for a camera and actor, a suitable set would have to be constructed in the studio. Initially, there were only two options available. 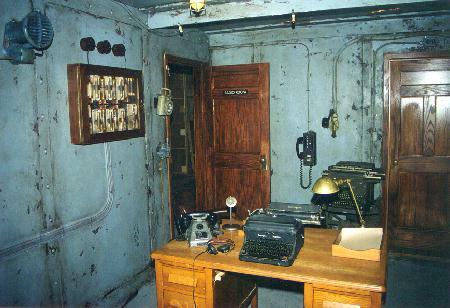 The first was to construct mockups of the equipment based on photos of the radio room aboard the museum Liberty ship, SS. John Brown. Vintage knobs, meters and controls would have to be located in Toronto's three radio surplus stores. This was a costly and time consuming option so it was on to the next idea. Perhaps some vintage Radio Marine Corporation of America (RMCA) radios could be located, rented and transported to Toronto assuming some reasonable shipping distance. That option proved to be impractical as no equipment of this type could be located anywhere. Realizing that another solution was in order, I proposed they rent some of the radios fitted aboard HMCS HAIDA. It wasn't RMCA or Mackay gear but it was Marconi shipborne equipment and it was WWII vintage. Months went by, then I was contacted by Oswego. Jim decided that the best and only option was to use HAIDA's radio equipment. In late July, various radios were designated, de-installed, picked up and transported to the company's studio located on Eastern Avenue in Toronto. Within days, a realistic looking and correct-vintage ships radio room was created by the artistry of the production company. The finish on the set included spots of grime, rust and grey peeling paint, all undesirable characteristics which come free on real ships. The amount of effort devoted to such small visual details was incredible and the epitome of that effort was the fuse panel and bare copper transmission line. 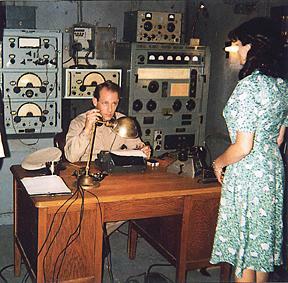 Both ideas originated from HAIDA's radio rooms. For making the equipment available for use in the movie, Oswego made a generous donation to Friends of HMCS HAIDA. GREAT JOB! Because of my work schedule, I wasn't unable to visit the studio during production hours to photograph the radios. By the time I got there on August 4, one bulkhead was dismantled and the radio equipment was being packed up. This photo should illustrate the essence of the scene. (Photo by Jerry Proc). SOLITARY STILL: This photo of the set was provided to me by Oswego. 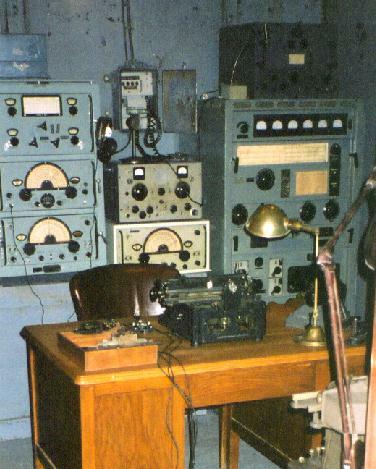 All the gear in the photo was made by Canadian Marconi in Montreal between 1942 and 1944. At the left is the CM11 LF/HF transmitter/receiver. In the centre is the FR12 LF/HF low power transmitter stacked on top of the CSR5 receiver. At the right is the Marconi PV500 HM2 transmitter with a regenerative receiver (Type TE-236) stacked on top.